Aaron "Foo" Combs has been a fan of Star Wars "since birth." It was the first movie his parents took him to. Aaron says,"Han Solo being tortured really affected me, and not in the good way if you know what I mean. I have had an issue with things being near my eyes ever since. You know, the whole 'red hot sparking pokers in the face' thing. Ouch. That was a disturbing walk down memory lane. Maybe that explains some of my violent tendencies." Aaron's favorite event so far has been the Grand Rapids Griffins event in '09. 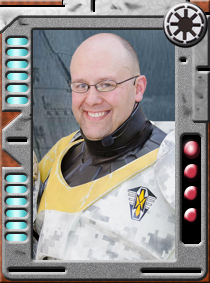 He was a huge hit as the first Republic Commando in Michigan. "Now that our Delta Squad is growing, I can't wait to storm some suites to empty peoples wallets!" he says. Aaron loves the hockey events because "you don't sweat that much!" Outside of the Legion, "Foo" serves in the Army. He has been in the Military Police for 14 years and started out life in the Army enlisted. Foo then went to the Dark Side and became an officer, achieving the rank of Captain. He currently teaches in the Reserve Officers Training Corps. "I must have done something right if they trust me to create new Lieutenants." Aaron has also walked away from three helicopter crashes and was in charge of the Guantanamo Bay detention facilities. He has also perfected the Jedi mind trick for getting store employees to pull things out of the back room for him as well. When asked about his nickname, Foo explained "F.O.O. is an acronym for 'Force Of One'. I was at a Green Day concert back in college and some dude sucker-punched me. I wasn't real happy and he and his friends wanted to roll. So, fight ensued and I ending up taking 5 guys down. One of my instructors was there and saw it and said 'man you were a force of one out there.' He later called me F.O.O. and it stuck." Outside the Legion, Aaron is happily married and the proud father of two daughters. He is very active in his church, where he sings in the praise team, does drama, and leads the high school youth group. He used to play video games or tried to read a Star Wars book in his free time, but now he is the official seamstress and resin caster for Republic Commando costumes around the world. He makes the RC neckseal for all RCs, and the Sniper Attachments for Sev and other sniper builds.